Washi what we did at CASology! One of my most fabulous friends: "Wiki tape?? Wacky tape?? Widget tape??" Me: "No; washi tape (LOL)!" 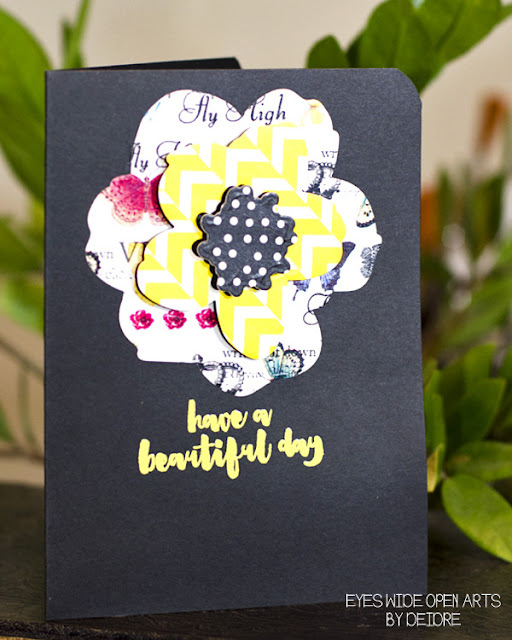 I'm an addict for anything floral and this Mondo Magnolia die from Essentials by Ellen Hutson is totally gorgeous! 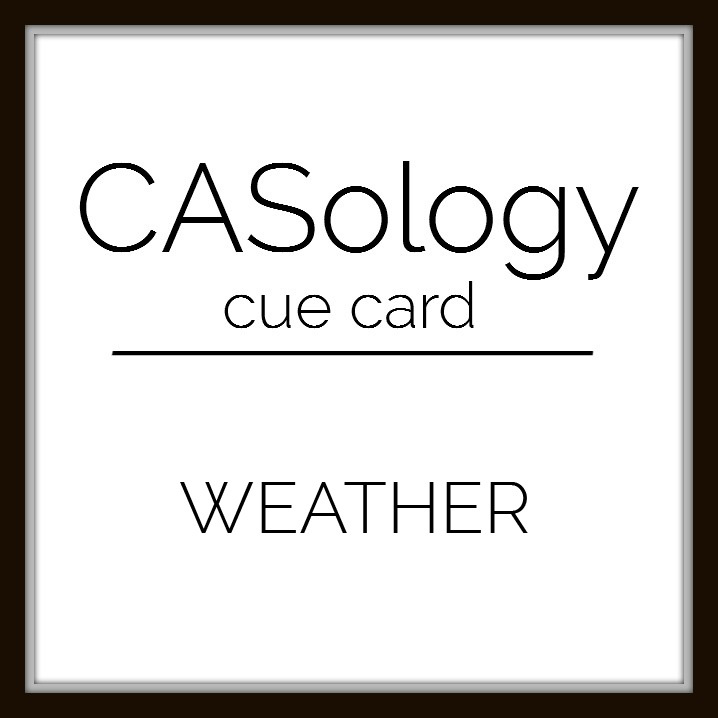 This card was super easy to make too. Pick out 3 different washi tape patterns and use to cover 3 pieces of cardstock that you're going to die cut (1 for each layer of the flower). 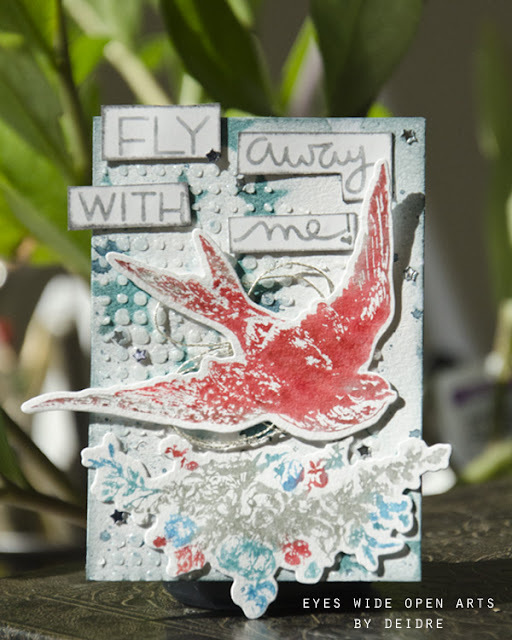 Run each layer through your die cutting machine. 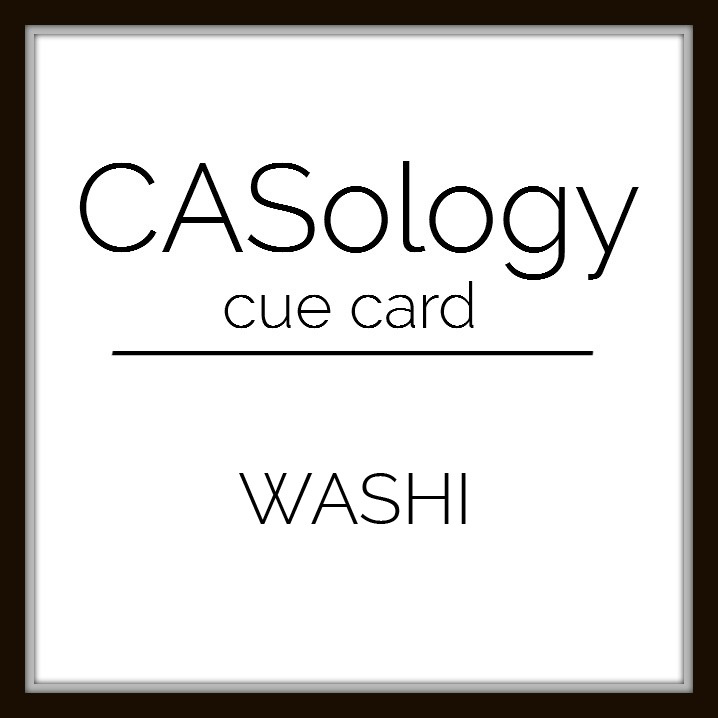 Adhere the largest layer directly to the card base. Add 2 layers of foam tape to the middle layer. Add 4 layers of foam tape to the center. 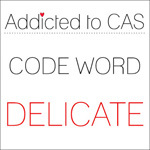 Dimension, dimension, dimension, but still CAS!! The sentiment is from the matching stamp set. I loved this mix of patterns! 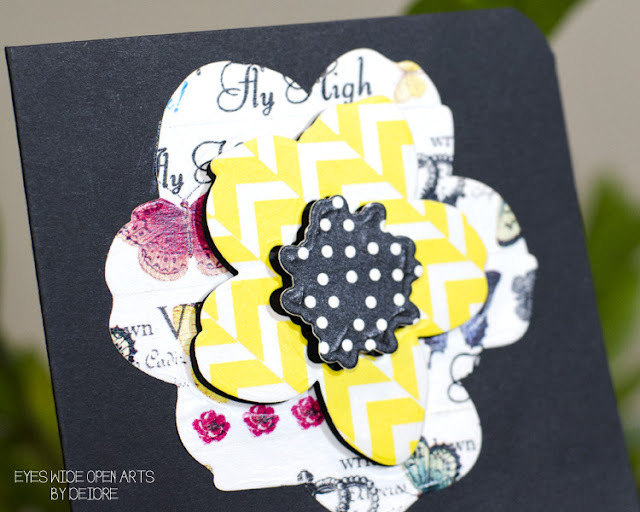 Intentionally offset each row of tape as you add it to the paper so the design on each layer doesn't appear so matchy-matchy (best demonstrated here with the yellow and white chevron washi). The DT has really "rolled out" some awesome inspirations that will surely "stick" with you! Head on over to their blogs and show them some love. 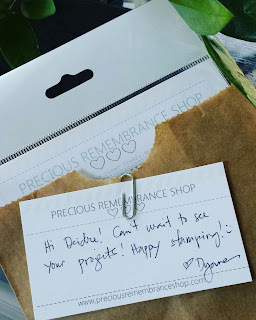 new release from Precious Remembrance Shop! 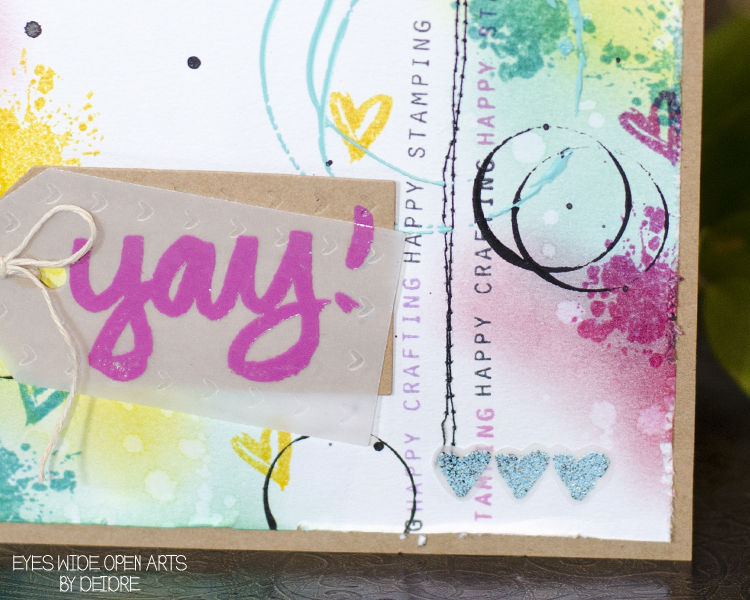 Check out the "Happy Art Stamps" set! Yay! That was exactly what I thought when I saw this new stamp set. It definitely made me a happy stamper/crafter :) I think this set screams for some mixed media action...and I couldn't resist! and a paper distressing tool for the edges. Now the real fun- inking up this awesome stamp set! Alternate the "Happy Stamping" and "Happy Crafting" stamps in different colors. Stamp 3 sets of the trio of hearts on vellum and heat emboss using different EPs and cut out and adhere to card. 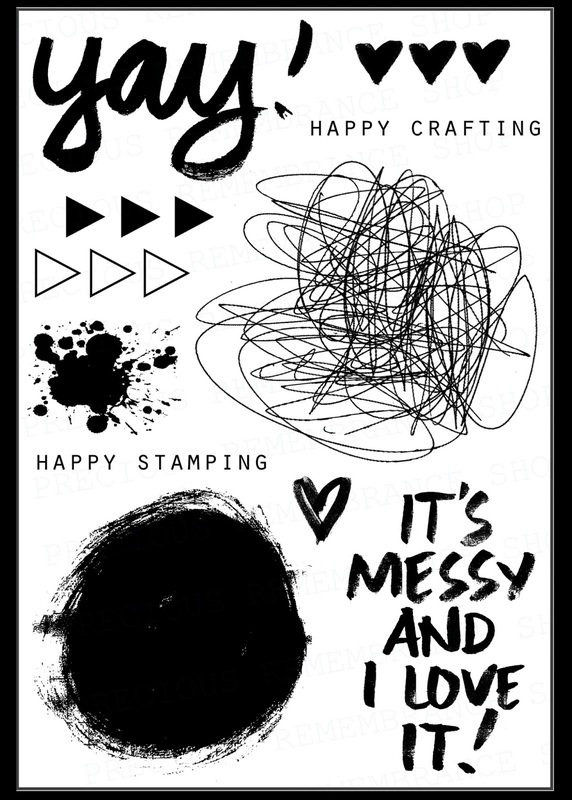 Stamp that amazing ink splatter from the new stamp set in various spots on the card. 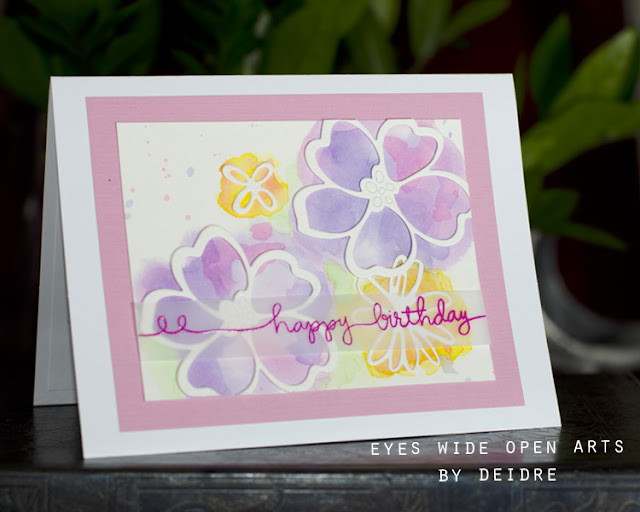 Fill in spaces with the single heart stamp and the trio of hearts. Stamp the "yay!" on a die cut tag and heat emboss with a bright EP. 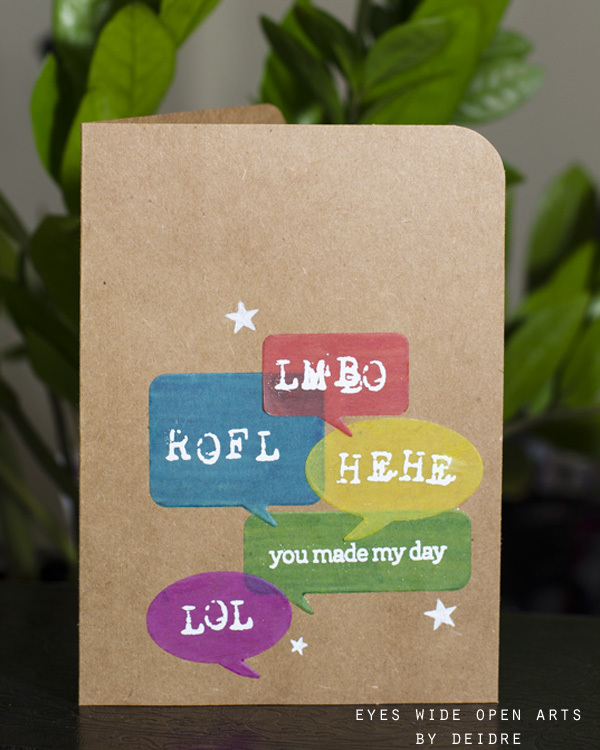 A little jute bow and kraft card base and you can call it a day! yep, sent right to your mailbox free of charge. Good luck! To keep updated with our projects, join us on Facebook, Pinterest, and Instagram. Thanks for stopping by and don't forget to comment below for a chance to win! Have a great day! If it's anything where you live, like it is here in VA, the signs of spring are right on track. We've had sunshine and rain, cool nights and warm days...and allergies and sinus issues kicking in full swing :) So how great that the cue card for CASology this week is: WEATHER! 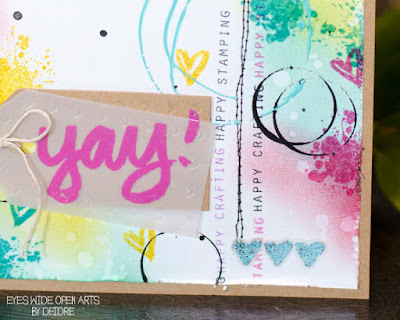 How funny is it that fellow DT member Kymona Tracey and I had the idea to use the exact same stamp set- it's from Create A Smile, titled "Bad Day"- and the same stamps from it LOL! It's hard to see in this photo, but I used my wink of stella clear pen for the rain drops. 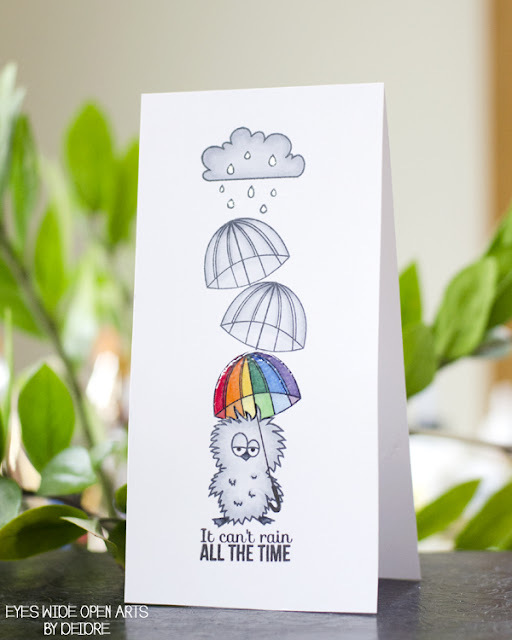 The DT has some great inspirations to brighten your day and get you going on your WEATHER cards! Blow on over to their blogs and don't forget the Guest Designer for the week! Have a great week and can't wait to see what you post in our gallery! Artsy, sweet, fun, unique...show me stamps that meet those criteria and I'm sold! Lucky me, I've found exactly that with Precious Remembrance Shop!! I'm over the moon that Dyane (the owner and designer) has asked me to join the amazing line up of artists to showcase the upcoming new stamp release *squeal* :) If you've not had a chance to get to know them, definitely take a stroll through their online store and check out some great cards and projects on their blog. Mark your calendars for March 24th! 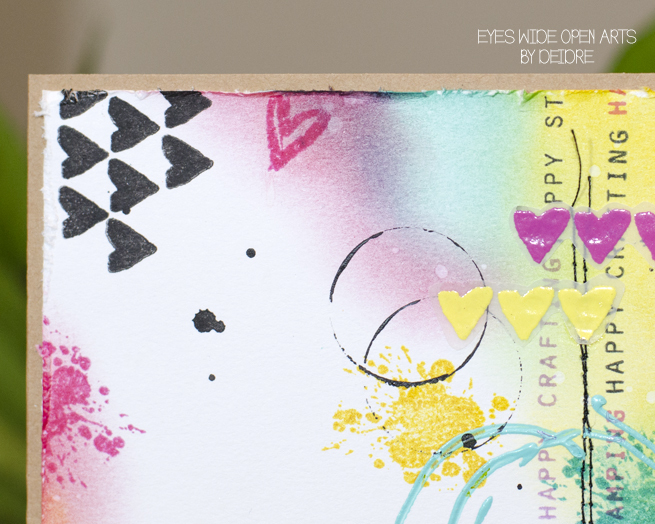 ideas, creativity, and must-have stamps! If you're like me, a pen and paper and boredom calls for some scribbling. 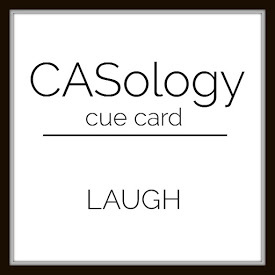 I even named one of my doggies after my love of doodling; his name is Scribble :) Anywho, this week CASology has you covered! Our cue card is: DOODLE. I didn't actually have to take pen to paper for these awesome frames, the stamp set was an on-sale find at Michael's last year. I love the look of them; perfect for this week! I did add my own extra scribbles to the flowers though. Then I coated them in glossy accents :) And it's hard to see in the photo, but I also ran a C1 Copic marker around each frame for a depth...it's a nice little trick for one-layer cards. cool squiggles they came up with this week! And a huge awesome thanks to STAMPlorations for sponsoring this week! They even gave us our own coupon code for you to use this week: "CASOLOGY" to save 10% in their online store, woot woot! Thanks for stopping by...now go doodle! How many different ways do you text people to show them you think something's funny?? Well, here are just a few of my usuals...and I even censored myself :) If you're a textaholic like me, I bet you've seen all of these! I am so in love with these Essentials by Ellen dies and I thought they made the perfect birthday card! If you haven't used Peerless Watercolors...get you some! OMG! They blend beautifully and are so portable and easy to work with. Place the blossoms die cuts on the watercolor paper (no adhesive) and use plain water to trace the outside of them so you have an idea of where to drop in the color. Set those flowers aside. Add multiple layers of watercolor paint, patiently letting them dry between layers....sike, using a heat tool to dry them :) This is really loose painting, dabbing the color from a larger round #10 brush into the wet areas. 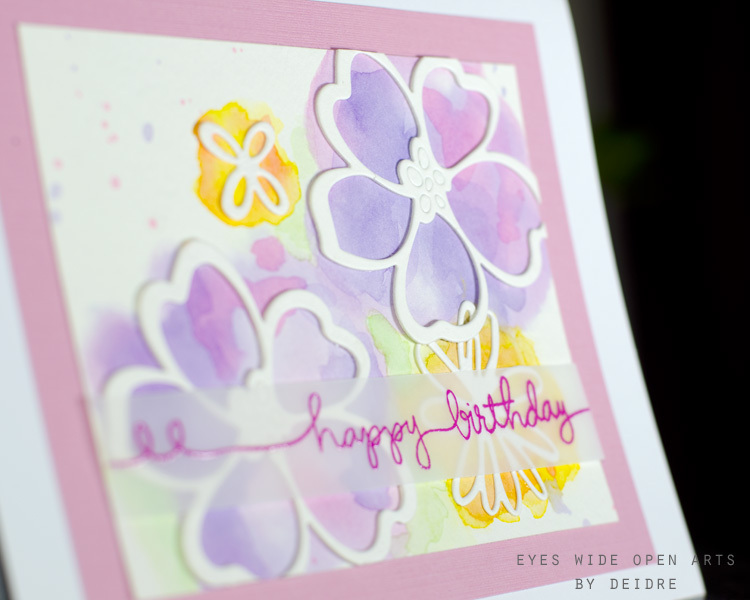 Stamp and emboss the birthday sentiment on a strip of vellum and you're all set to mat it onto a card base. Oh yeah, it's me, so don't forget the splatters! Look at the dimension you can create with just 2 layers of die cut watercolor paper! CASology is back with a challenge that will have ideas whirling in your head this week :) Our cue card is: SPIN. I knew the Design Team was going to have some fun with this one! My family loves (I mean really loves) to take mini vacays in Vegas. And I have to say, the roulette table is our gambling poison of choice for everyone :) This is a digi image that I colored with Copics and the sentiment's from a MFT & Dienamics set called "Game Night". I die cut the number 21 (trust me when I say wait 'til you're legal drinking age to make the trip, lol) and then used gold embossing powder to cover them before returning them to the card as an inlay. 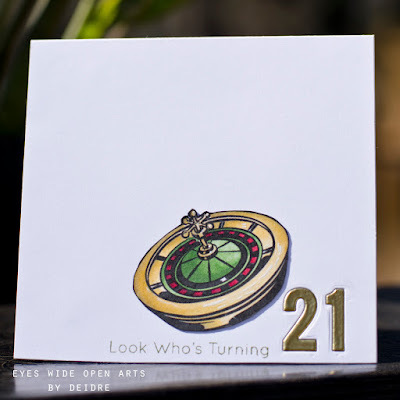 So, now that I'm thinking about the next time I can get to Vegas :) why don't you twirl on over to the other DT pages and our Guest Designer and take a look at their inspirations this week!